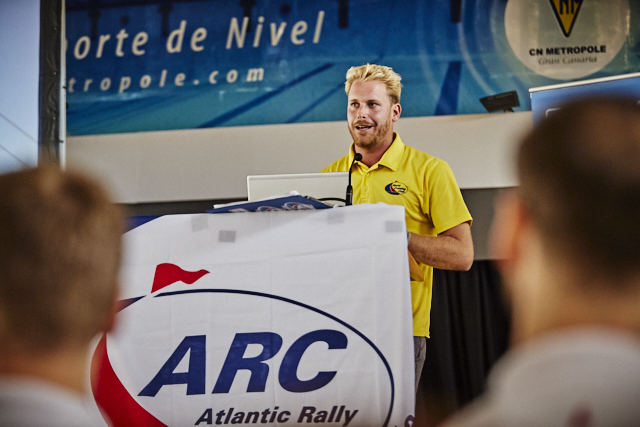 The last couple of days has seen a busy schedule of ARC seminars sharing a wealth of knowledge with crews as they prepare for their Atlantic crossing. Taking place in a new venue this year, the Club Metropole, it was great to see so many participants benefiting from the wide range of talks conducted by highly experienced speakers; Chris Tibbs, Jerry Henwood, Clare Pengelly and Stokey Woodall. Additionally World Cruising Club Corporate Members, PYD (Professional Yacht Deliveries), Peters & May (yacht transport) and Red Square Medical (medical services) provided excellent talks in their respective fields which participants found extremely useful. After a long day of learning, it was time to unwind and have some fun at the annual ARC Costume Party. 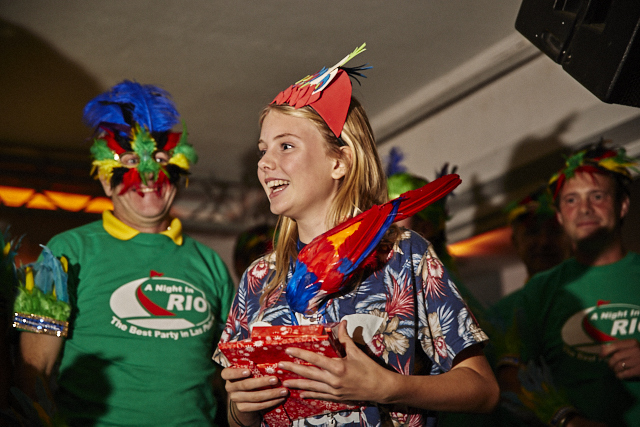 This year’s theme, which is the same as the annual Las Palmas Carnival, was ‘A Night in Rio’ with plenty of colourful costumes bringing the Brazilian flare to the Sotavento Club. 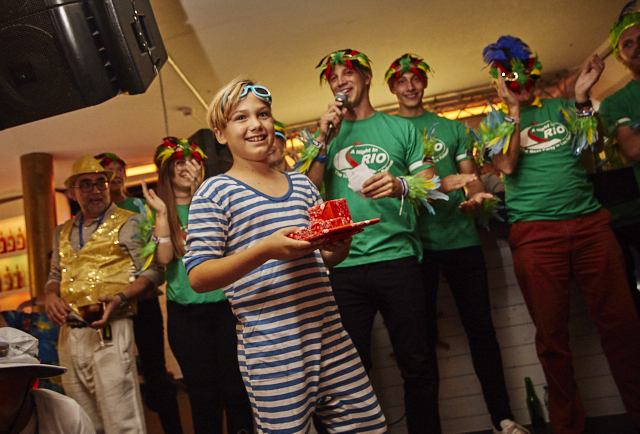 Crews were greeted on arrival by the ARC team in matching shirts and fetching feathers, a welcome drink and soon headed to the dancefloor. 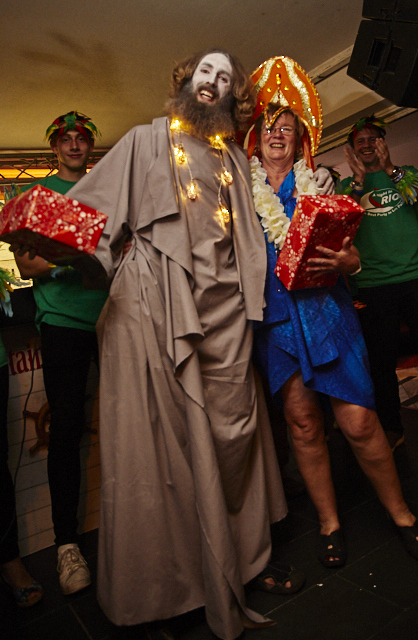 Prizes were awarded for the beat costumes in theme, and this year the category winners were: Best Boy: Konstantin on Trinity III, Best Girl: Milly from Alesea, Best Man: Tim on Excalibur, Best Woman: Heike from Endo 2 and Best Couple: Rod and Nina on Bimble. 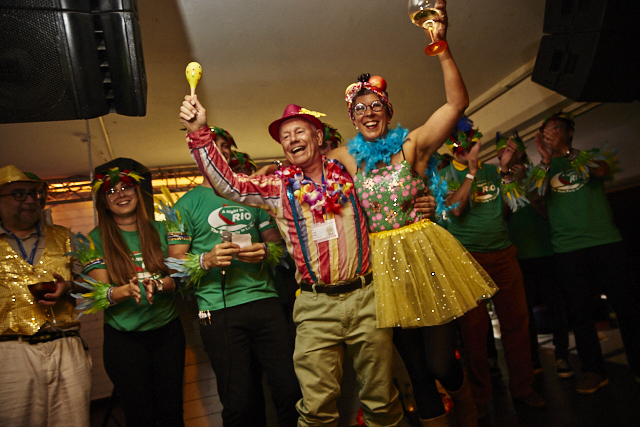 After a ‘dance off’ on stage, Challenger 3 were given the coveted award for best crew and were presented with a case of beer sponsored by Ahembo. Day twelve in the ARC calendar brought one of the most popular events in the two-week programme, the air-sea helicopter demonstration. Hamble School of Yachting are the training provider for World Cruising Club and organisers of the ARC demonstrations liaising with the Sociedad de Salvamento y Seguridad Marítima for the SAR (search and rescue) Helicopter Demonstration, supervised flare deployment and interactive liferaft demonstration. Well over 200 participants gathered on the Northern Breakwater to watch the rescue helicopter perform a text book rescue exercise. Yacht Pure Elegance, a Dufour 560, kindly volunteered to be the demonstration boat for today’s exercise. Owner and skipper Graham Ponsford said, ‘It was a really great experience,’ and mentioned how different a real rescue could be outside the calm conditions in the harbour today. This is exactly the purpose of today’s demonstrations, in preparation for the ARC, the dedicated team of safety inspectors have the opportunity to show and let participants experience the use of safety equipment similar to items they may have on board. Cloudy skies did not dampen spirits on board Pure Elegance, crew members, Sarah, Clinton and James were elated after the exercise and very grateful to have had the opportunity to be involved. During the afternoon, the practical training continued for some with an optional three-hour First Aid session, run by Red Square Medical. 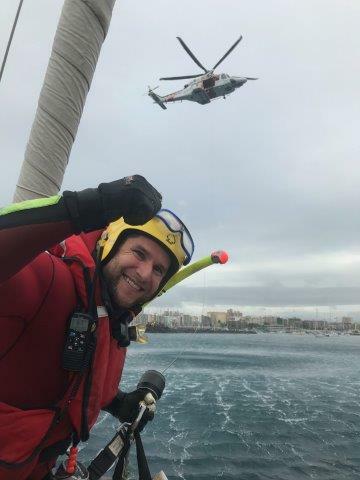 It was a welcome refuge from persistent rain showers in Las Palmas Marina, as well as providing valuable insight for assessing an ill or injured person, and coping with medical problems at sea. Dr. John Ross, medical director of PRAXES Medical Group, was also available for a drop-in session on the ARC platform to answer questions one-to-one for any medical concerns.